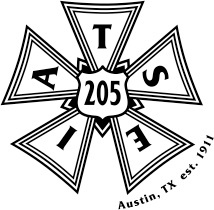 Since 1911, The International Alliance of Theatrical Stage Employees, Local 205, has been serving the Austin area as the labor union representing technicians, artisans and crafts persons in the entertainment industry, including live theatre, concert, and convention events. We are the source for professional experienced personnel, including Stagehands; Scenic Carpenters; Properties Personnel; Projectionists, Riggers; Wardrobe Personnel; Wigs, Hair and Makeup Specialists; Lighting Technicians; Sound Technicians; Audio/Visual Technicians; Camera Operators; and Decorators. We can cover your stagecraft needs from corporate meeting to musical theater. Contact the Business Agent of Local 205 for information on staffing your production at 512-371-1217 or gro.5155571487802EST1555714878AI@tn1555714878egAss1555714878enisu1555714878B1555714878. Interesting in joining Local 205? See our Membership section. IATSE Local 205’s jurisdiction covers live events in Austin such as theater, festivals, concerts, trade shows and conventions. For film work in Texas and Oklahoma, you should contact: IATSE Local 484. Subscribe to get Local 205 news and posts delivered to your inbox.